In an effort to maintain my title of collaborator with Paula, my hero- I had to grow another head. Our plan, as it has unfolded, has been to supply each other with heads and bodies, respectively, (heads/ me and fabric bodies/Paula) and see what happens- I've been playing catch up ever since. I have several bodies, one that has all its parts (but not finished) as seen in an earlier post, and more that have clearly spoken to me that I have not yet translated. 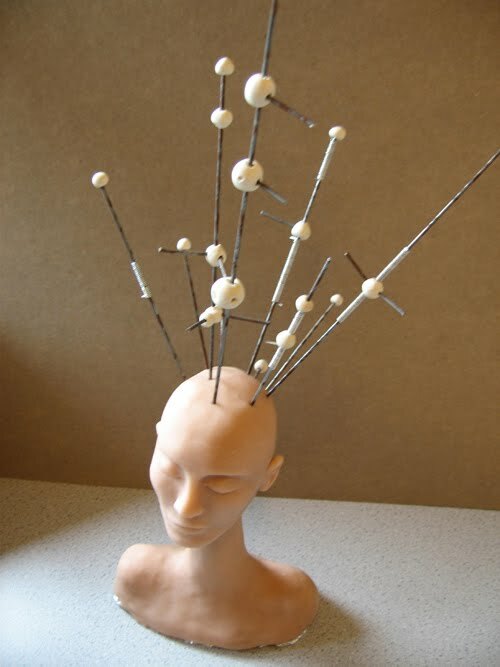 So, this heavily Lee Bonticou inspired head, will be the first head that Paula will be translating. In true Paula/Jean style we have already emailed back and forth with the pretty much the same ideas for her finishing. I think we are taking "making friends" to a new level.